When a road is built, there’s more to it than just what you see on the surface. The pavement doesn’t simply get placed with nothing underneath, it needs to have a strong foundation in order to perform well. An important part of that is having a properly designed and constructed base layer. In this edition of the RoadReady newsletter, we will focus on the use of aggregate materials as unbound base and embankment layers in a pavement structure. Aggregate refers generally to granular materials such as sand and gravel that are used in pavement construction. Used by themselves, aggregates are commonly utilized as a base course, subbase, or embankment underneath the surface layer. These layers rest directly on the subgrade (the native soil or fill material on which the pavement structure is built) and provide additional support to the structure. When mixed with asphalt binder or portland cement concrete (PCC), aggregates are a significant component of pavement surface layers as well. Spreading an unbound aggregate base layer. Aggregate base layers are regularly used in both asphalt and PCC pavements and serve a variety of functions. 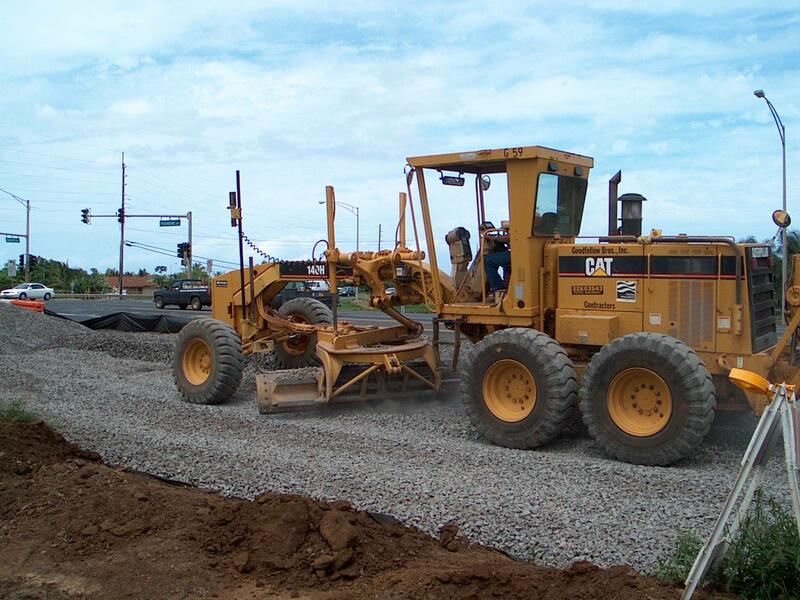 Since subgrade soils may be soft and unstable, an aggregate base often helps ensure the stability of the pavement surface. This includes providing a working platform for paving activity, since equipment operations could lead to rutting and areas of weakness in the subgrade. For asphalt pavements, aggregate bases are important structural components and help distribute load stresses through the full depth of the pavement. In PCC pavements, an aggregate base serves primarily to provide the necessary uniform support conditions for the concrete slabs. Unbound aggregate base layers can be used for drainage purposes, since the fact that they are not bound with asphalt or cement allows water to pass through gaps in the aggregate. In colder climates, aggregate bases also help to insulate the pavement surface from freeze/thaw cycles. Sedimentary rocks – limestone and other rocks created by sedimentary deposits. Igneous rocks – granite and other rocks created by cooling volcanic or molten rock material. Metamorphic rocks – sedimentary or igneous rocks that have been subjected to enough heat and/or pressure to change their mineral structure. One type is not necessarily superior to the others, as the quality of aggregate depends on the physical and chemical properties of the specific material. Which types are commonly available will depend on the geologic history of a region. 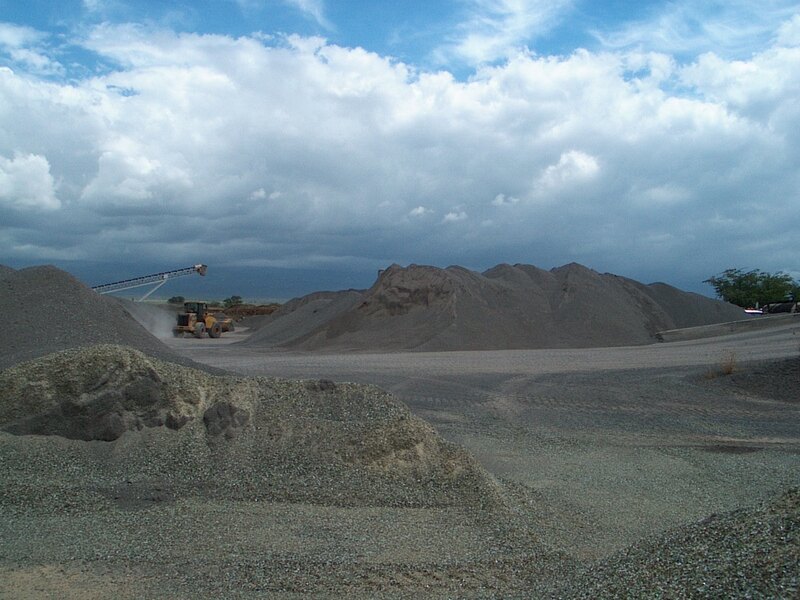 The aggregate stockpile in the foreground at this asphalt plant consists of recycled glass. Some regions have inadequate sources of aggregate, as local quarry resources may be too scarce or of insufficient quality for pavement construction. If the cost of obtaining natural aggregate is prohibitive, it may be possible to substitute suitable manufactured materials or byproducts. Both reclaimed asphalt pavement (RAP) and recycled concrete can be used to make high-quality base layers. Other industrial byproducts including furnace slag and waste glass are also feasible alternatives. A number of material properties and characteristics affect the performance of an aggregate base layer. One of the most important is the gradation, or the size distribution of aggregate particles in the material. Others include the ability of the aggregate to resist damage and its particle shape, texture, and angularity. Bases may consist of uncrushed virgin aggregate or material that has been crushed in order to create more rough surfaces and angles. Uncrushed material should be used with care, as the aggregate particles can slide around and reorient themselves more easily. This leads to reduced pavement strength and can potentially cause deformation and rutting under loads. A number of agencies (including roughly half of U.S. states) specify the use of crushed aggregate for unbound base layers. At the same time, crushing will increase the proportion of fine particles in the material, so it is important to determine and maintain the appropriate aggregate gradation. In considering the base as a layer within the pavement structure, its density along with its moisture content and drainage characteristics are also important. Achieving the desired density typically requires using compaction equipment before the pavement surface layers are placed. A base layer of dense-graded aggregate, with a mix of particles sizes tightly packed together, will generally provide the most structural support for the pavement surface. On the other hand, open-graded or gap-graded bases with fewer small or intermediate-size particles may be more effective for drainage purposes. Sometimes these considerations make it appropriate to construct more than one base or subbase layer with different characteristics, depending on the design and needs of a particular pavement structure. A variety of methods are used to evaluate materials for an aggregate base. The size and gradation of aggregate particles is determined by sieve analysis. For proper gradation, this should be performed with washed aggregate material, as dry sieving can produce erroneous results due to fine material sticking to the surfaces of larger particles. Screening for particle shape and texture may include tests for coarse aggregate angularity and flat and elongated particles. Resistance to damage can be tested both physically and chemically. Physical toughness and abrasion resistance tests include the Los Angeles abrasion and Micro-Deval procedures. Chemical testing of aggregate durability involves the sodium sulfate or magnesium sulfate soundness tests. To determine the strength of the base layer, triaxial testing will provide the most realistic estimate of how the aggregate behaves under loads, but the procedure requires an investment in training and equipment. Some agencies use simpler empirical tests like the California Bearing Ratio instead. An aggregate base may be hidden from sight after the pavement is completed, but it remains a critical part of the pavement structure. Unbound aggregate base layers require good materials, proper design, and quality construction practices. Building the foundation the right way will help the entire pavement perform properly. Densly graded base course normally is expected to provide firm support to the overlying layers with resistance to relative movements of the aggregates within the base course layer. As such good riding quality of the pavement may be maintained for considerablly long time. However, the gradation being dense, restricts formation of conduits within the layer. Thus drainagability of the base cousre is adversly affected. Moreover, the inter grannular contacts between the coarse aggregates cannot be created due the dense graded characteristics of the base course. The base course, therefore cannot function as a unit mass or matrix.It therefore lacks excessive resilience against shear deformation. It may therefore be required to design aggregate base course that would be drainagible and resistant to aggregates relative movements and at the same time would exhibit intergrannular contacts between the coarse aggregates of the base course. Bases and sub-bases are provided in concrete pavements to provide a rigid and strong support for concrete slabs. If concrete slabs are placed directly on the compacted subgrade, moisture changes in future may lead to expansion and shrinkage of subgrade which eventually becomes weak and this will be reflected in concrete slabs in form of subsidence, cracks etc. Also riding quality will be lost thus increasing vehicle operating costs. It is usually that bases are used for structural purpose and sub-bases used for drainage purposes.